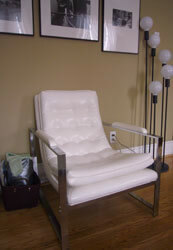 As a sucker for all things space-age mod I have always, always adored white upholstery. But as my boy is always reminding me, I am also a rather messy, klutzy girl. I am perpetually spilling drinks and dribbling crumbs of food around where I sit, which inevitably get ground into the upholstery as I lounge around oblivious to the fact that half my food has ended up on the sofa rather than in my mouth. In short, white has a tendency not to stay all that terribly pristine in my vicinity, and in the past, I’ve reluctantly avoided it in my soft furnishings. So I was particularly excited that one of these vinyl chairs I’d scored was a beautiful pure white – vinyl being an ideal material for messy folks like myself, as spills wipe up easily from its surface. Still, once I brought my chairs home and began looking more closely, I realized that vinyl might be easy to clean when the dirt is fresh … but when the grime’s been sitting around in those crevices for a few decades, it still requires a fair amount of work. Yes, as the seller had warned, both red and white chairs alike were in need of a good scrubbing down. After snooping around online for vinyl cleansing tips, I learned that harsh solvents are best avoided if at all possible, as the chemicals can react with the vinyl and weaken or otherwise mar it. Good old soapy water seemed to be the best cleanser, so off I went to fill a big bowl with warm tap water and a light squeeze of regular old dish detergent. Indeed, using the sudsy water combined with a cheap terry cloth rag – the texture works well to dig up dirt from the crevices – my chairs were already looking a whole lot more presentable. To get at the gunk nestled in the deeper crevices of the vinyl, I used an old soft toothbrush (always good to have around for cleansing purposes, by the way). Finally, for marks that just weren’t budging with the soapy water, I tried my favorite miracle cleanser, white vinegar, which did a dandy job in combination with the toothbrush.